Congrats! And what a great sandwich! Must put on my lunch menu ASAP!!! Your blog is such a rich source of excellent summer sandwich recipes. First, your wonderful chipotle burger and now this delicious twist on the club sandwich. Both are on my definitely-must-make list. Many thanks for sharing! 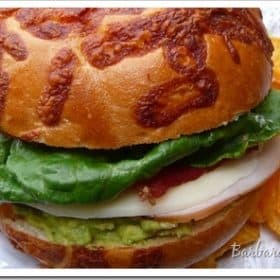 This filled sanwich with the bacon & guacamole looks so tasty & fantastic too! Congrats for your many awards!! Yeah! Yum! That sandwich does look stellarly delicious. Looks amazing! I love anything with avocados. Yummm. This looks great! I 'm so glad I came across your site! I like the sound of blogging recipe swap, kind of like a guest post isn't it? Well done on the awards, very well deserved! ps for months I have imagined that your surname was "Bakes" so I had to do a double take on my facebook page!!! Thanks for "liking" me! I love CLUB sandwiches, and I love Guacamole even more! I would die happy eating this! This is really awesome and congratulations on the awards! I love Newport Beach, we used to go there a lot when we lived in Vegas. It's a bit too far from Wisconsin though! LOL The sandwich looks delish! Goodness gracious!! That is my kind of sandwich! I recently discovered the delectable pleasures of adding guacamole to my sandwiches – I now put it in my egg and cheese breakfast sandwiches! Delish! Thanks for sharing and congrats on your awards! How nice to introduced to a new blogger! This sandwich sounds delicious, some of my favorite ingredients and perfect for a summer meal. That sandwich does looks like it would live up to it's name! great club, love the bread..congrats on your awards.. I KNEW it would include avocados! YUM! I'll have to try this sandwich for sure! A meal in itself! Enjoy your vacation(sounds like you are)! Wow, I love the looks of this sandwich! I also would love to visit that farmer's market. Have a great time Barbara. And those cheese rolls…YUM. That would certainly add another layer of flavor to this super sandwich. Congrats on all the awards….you deserve them all! You derserve all these awards and more…your dedication is very appreciated. Thanks for saying such nice things about mine…especially since we've known each others blogs for such a short time. Here's to enjoying all our furture goodies togther.